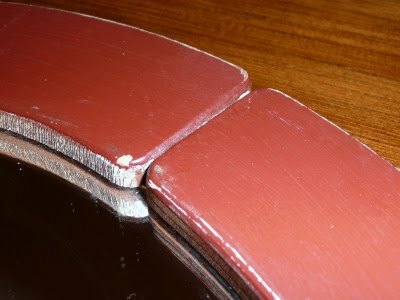 Thrift Store Mirror: What to Do? 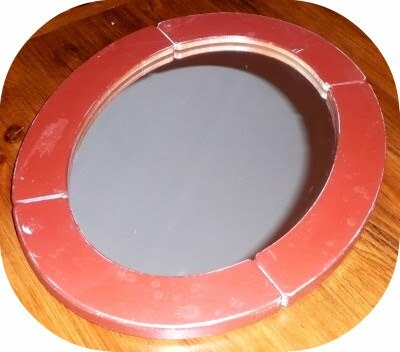 While I was out shopping with my girls last week, I found this cute red mirror at the thrift store (for $2.99!!! ), and I'm having trouble deciding where to hang it. When I bought it, I thought I was going to paint the frame black and hang it in our entryway. But then I decided that maybe the red color looked fine as is. The finish is kind of chipped and worn, which I like. Then I thought that maybe it isn't big enough for the entryway, and I should hang it by the back door in the mudroom (which really isn't a mudroom at all, just a "mudwall"). 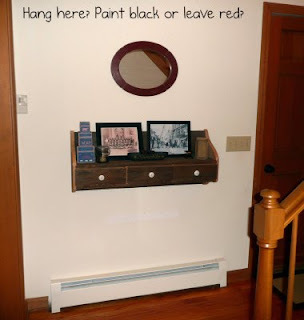 If I hang it in the mudroom, I'm definitely leaving it red, because I kind of like the eclectic mix of things I have on that wall, so I wouldn't want it to match the shelf. And I think I would get some sort of old wire basket to hang underneath it. What do you think? Black or red? Entryway or mudroom? Any other ideas besides a wire basket underneath? 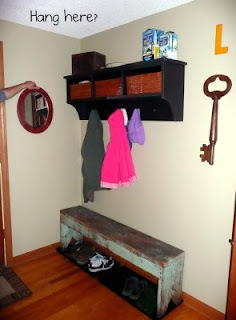 I really like it red in the mudroom/mudwall :-) An old locker basket would look great under it. I like it in the mudroom as well. A wire basket sounds great! You can always use more storage! Love the red, too. :) My favorite color. I like it in the mudroom as well! the red is nice and weathered just the right way! I think either is cute, but I can picture it in the entry way with two small square mirrors on either side of it, all hung by something like wire, jute, or ribbon. Just saying :) Cute find!